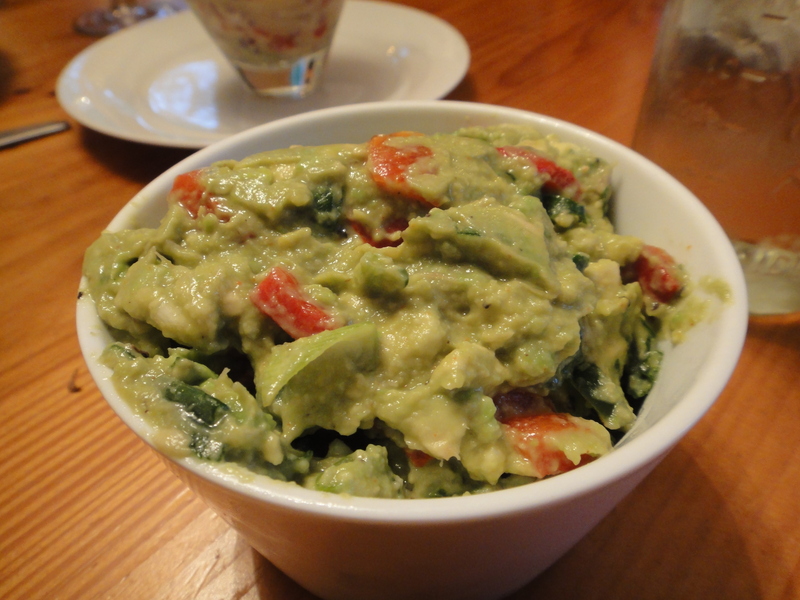 Part II of Branden’s birthday dinner brings us to the guac…a staple in Mexican meals in our household. Seriously, we’re nuts about it. As a kid, I remember hating the stuff- the green color was most unappetizing in my mind. Sometime while I was in high school, some switch flipped and I became obessed with it. Guacamole (my own made up recipe, in fact) was the first thing my Mom ever thought I could make better than her. To this day, she still will ask me to make it when I’m over. Sometime I’ll have to try to share my personal recipe, but its one of those things that doesn’t really have a recipe…I just kind of do my own thing, but I think I can at least share the gist of it. In a medium bowl, combine avocados and lime juice. Using a potato masher, coarsely mash avocado mixture until slightly lumpy. Stir remaining ingredients into avocado mixture. Serve immediately or cover surface tightly with plastic wrap and chill for up to 2 hours. If desired, serve with tortilla chips. Makes about 2 cups. Overall verdict: Decent- if nothing else, it was a different take on my usual guac and the roasted red peppers did compliment the enchiladas that I served it with (coming in my next post). I used coarse sea salt because I think its got better flavor than table salt. I also more than doubled the cayenne because I thought it needed a bit more kick. The final adjustment was lime juice, I used a whole lime just because that’s my personal preference.